In a world increasingly infiltrated by SUVs and alternative-fuel vehicles, it’s easy to forget those exciting traditionalists - the hot hatchbacks. They're a breed which offer a charming blend of speed, handling and practicality in a package lacking the ostentatiousness of Porsches or Ferraris. 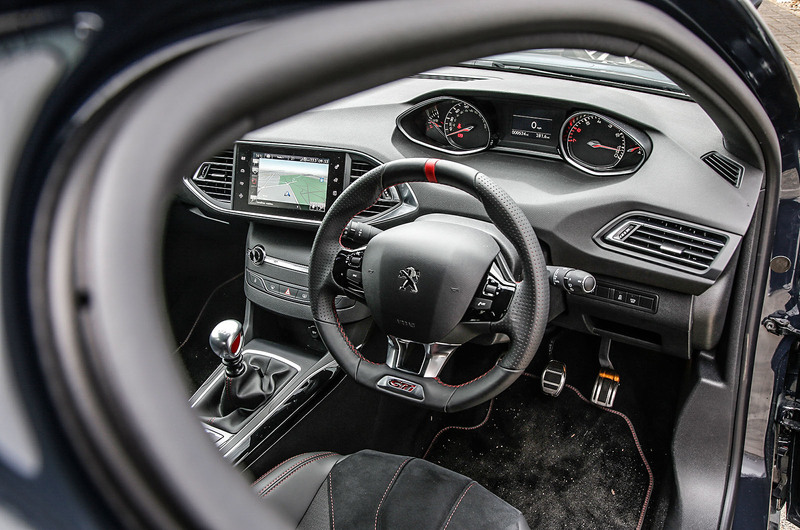 Admittedly, the Peugeot 308 GTi might not be the first to come to mind, especially up against rivals such as Volkswagen’s Golf GTI and Ford’s Focus ST, which often set a benchmark in this sector. Still, this stratum has many more in its grip these days; think Seat Leon Cupra and Renault Mégane RS 275, to name a couple. When the standard 308 arrived, it was a massive improvement over its predecessor, the mediocre 307. Hell, the 308 even won European Car of the Year 2014, beating the BMW i3 and Tesla Model S, both brilliant and innovative models in their own right. So can the 308 GTi chisel its own dent into this well-established groove? Following the Peugeot RCZ R and 208 GTi 30th Anniversary, both of which impressed our road testers, this is the latest French front-driver to hold promise — which is why we’ve decided to run one for six months. First impressions count: it’s a good looking, understated car that catches your attention without begging for it. The anti-kerbing 19in ‘Carbone’ alloy wheels (say ‘carbon’ with a French accent) and red Peugeot Sport brake calipers are of particular note, as is what the manufacturer unofficially calls the ‘front smile’, which is the lower grille outlined in red, a sporty accent in contrast to our car’s Hurricane Grey body colour. The understated aesthetic continues inside. I was quietly impressed with the 308’s simplified yet smart interior when it was first launched, and this carries over to the GTi. The only other remark to make here is that my parents’ first time in the car was met with pleasing murmurs along the lines of “comfortable” and “spacious” (although their awareness of the car was so low that they didn’t know it was a Golf GTI rival, which is perhaps telling). Because only the best will do, we opted for the higher of the two outputs offered, as it makes up the majority of GTi sales. We have the turbocharged 1.6 THP with 266bhp at 6000rpm, which has 19bhp more than its lesser sibling. Peak torque is 243lb ft at 1900rpm. All of that means a 0-62mph time of 6.0sec and a top speed of 155mph. Peugeot also claims the car has an unrivalled power-to-weight ratio in its segment. Using stop-start technology, which no doubt helps with CO2 emissions (139g/km) and economy (47.1mpg combined), the GTi has a six-speed manual gearbox. There’s no automatic option, which is no problem considering how good the manual shift is, but the popularity of VW’s DSG gearbox suggests Peugeot could be missing a trick here. Other than the slight tweak in power, one of the most notable distinctions between the two outputs is that our model receives a limited-slip differential — often the key difference between a good hot hatch and a great one. Also distinguishing it from standard 308s is the Driver Sport Pack, which Peugeot says increases the responsiveness of the engine and gearbox to the accelerator pedal, changes the instrument panel colour to red (from white), displays certain parameters such as acceleration, power delivery and turbo, and amplifies the engine sound in the cabin. As you’d expect of a top-of-the-range model, the GTi is garnished with plenty of extra design details and equipment. Alongside its exterior distinctions — which include tinted rear windows, an 11mm lower ride height, GTi grille with chequered flag design and side and front sports skirts — the car also gets GTi bucket seats trimmed in leather effect and Alcantara. And then there are the mod cons. This generation introduces a 9.7in touchscreen that controls nearly all functions in the car, making most buttons defunct, and through this you can control the sat-nav, DAB digital radio and Bluetooth, to name a few. Other day-to-day perks include dual-zone climate control, cruise control, automatic headlights and windscreen wipers, reversing camera, front and rear parking sensors, power folding door mirrors and keyless entry. One other feature absolutely worth mentioning is boot space, which smashes all of its competitors out of the park. It has 470 litres of space, versus 380 in the Golf GTI. I promise you a comical demonstration of what can fit in there, in a future report. So how much does it cost? The GTI is £28,455, and the only option we have is Peugeot Connect SOS and Assistance (£240), keeping things simple. It’s a promising start with the 308 GTI. Still, we’ve had little opportunity to employ it in its best (fast) guise yet, including the all-too-tempting Sport button, so we’ll be racking up the miles over the coming weeks to see how it fares for performance, while also maintaining its practicality and economy as a five-seat hatchback. Price £28,455; Price as tested £28,695; Options Peugeot Connect SOS and Assistance £240; Economy 34.8mpg; Faults None; Expenses None. The mediocre 307 was the predecessor to that, which in turn was preceded by the actually quite nice 306. Come on, you should know the order of your mediocre Peugeots. It's predecessor was actually the mediocre 308 ??? ........ Come on, you should know the order of your mediocre Peugeots. So the predecessor to the 308 was the mediocre 308?? It's all to early for me this morning. Peugeot were running out of numbers, so have stuck with the x08 badges! I need to get out more. Such a forgettable car that even Autocar forgot it. I would have done too, but my neighbour has one. I have to say that although I last had a fondness for Peugeot in the days of the 205 GTI, this model looks OK! Quite a smart suit of clothes for a French car, although its similarity to a Golf GTI is noticeable. Inevitably it is a big car though, and I am not too sure about the usefulness (other than some kind of style statement), of a rev counter which operates anti-clockwise! Just thinking the same thing, 289. This looks decent. Could see a 2 year-old one on the driveway.. The 308 is a lovely car to drive but it's far from economical unless you go for 1.6L BlueHdi. I would like to see hybrid technology introduced for this car.